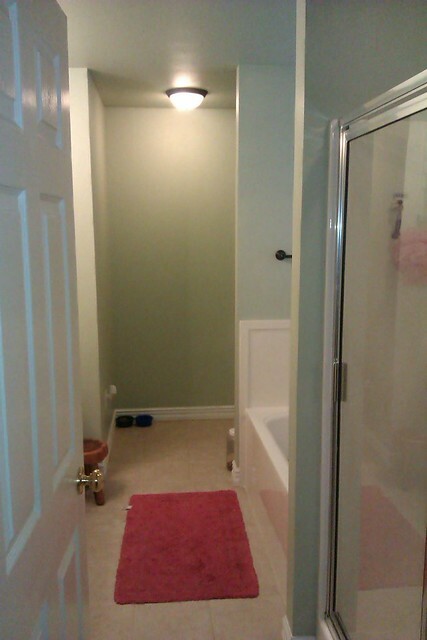 In our new house we have two bathrooms. Ideally I had wanted to have atleast 2.5 baths in our house. 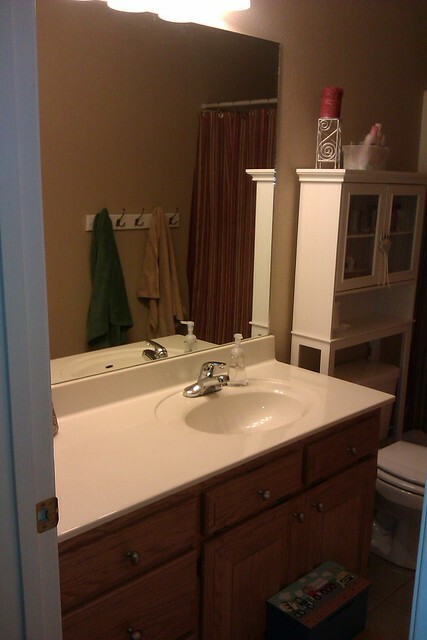 It's just nice to have a bathroom for guests that you don't have to worry about it having evidence that you have young boys present in your home :) BUT... the rest of the house kind of outweighed the fact that I was only getting 2 bathrooms... gotta give and take. 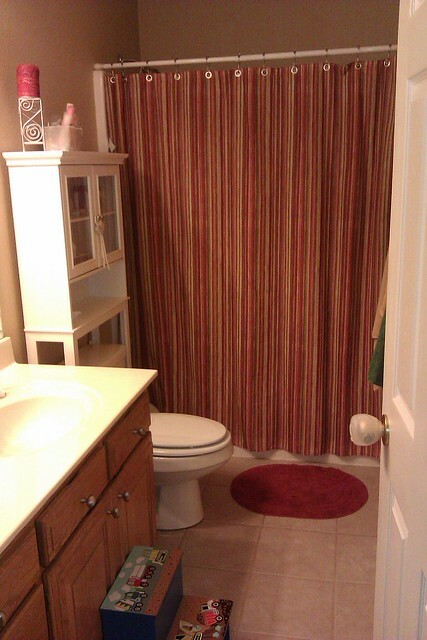 The master bath is even more plain than the boys bathroom, and our towels don't match at all. 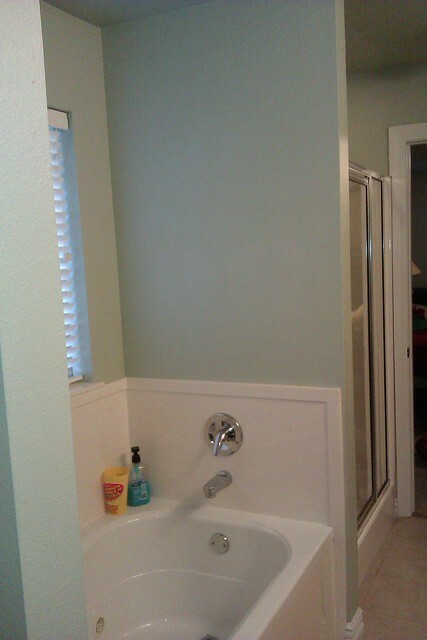 But it has a stand alone shower, which I love. The color is a beachy light green/blue color. It's really hard to describe, and these pictures don't really even look like what it looks like in person. This is the view from our bedroom. You can't tell in this picture, but the red rug was sprayed with bleach spray by Brayden about a year ago, and now it looks polka dotted from the spray. When I figure out what color scheme I'm going with on accent pieces (window treatment, towels, etc), I plan on replacing the rug. For now, it works. our sinks. 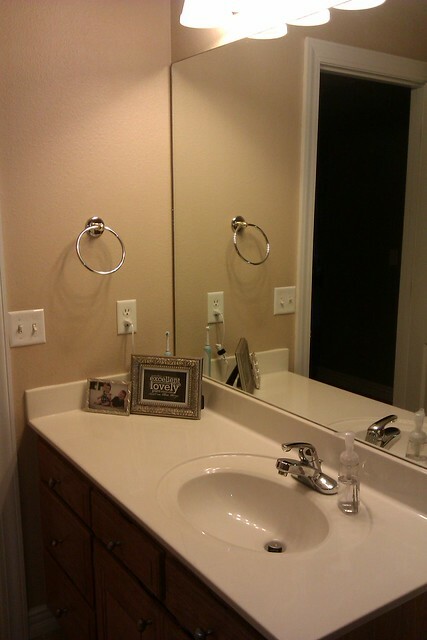 Our master bath cabinets have been restained from the original builders grade honey oak. I love the dark stain! FYI: no idea why those flowers are there, or why I keep them there. They ended up there during our unpacking process, and just have stayed. They really don't go with the decor at all- ha! Here's the potty area. 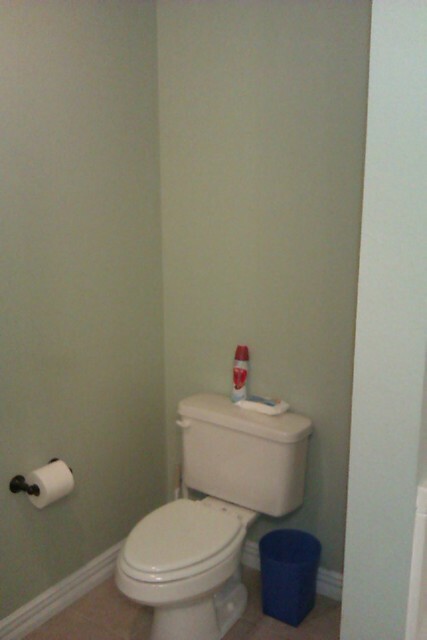 I am hoping I can find some sort of narrow storage cabinet to put against the wall opposite the potty. I hesitate putting anything up on the walls on this area until I figure out what I am going to do. The space is actually a lot bigger than it seems in this picture, which looks really bare right now. our jacuzzi tub. Can you believe we've been here almost 4 months and I've only taken 1 bath in it?! I'm just not a big bath girl I guess. I plan on putting up a stacked frame, similar to the chevron frame I made, on this wall. 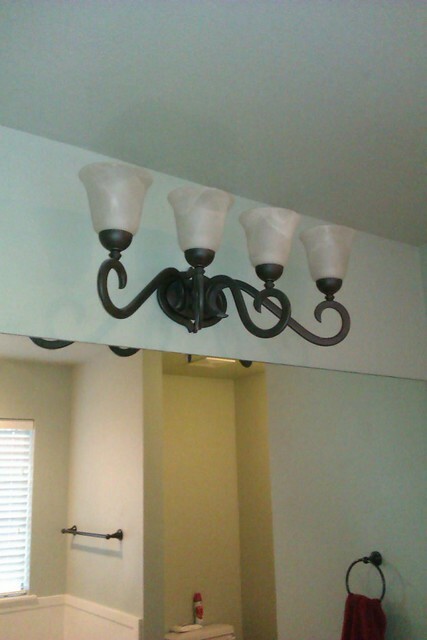 On the opposite wall is a towel rack, and I'm thinking about putting some type of ornamental metal on it. Not sure yet for that one. 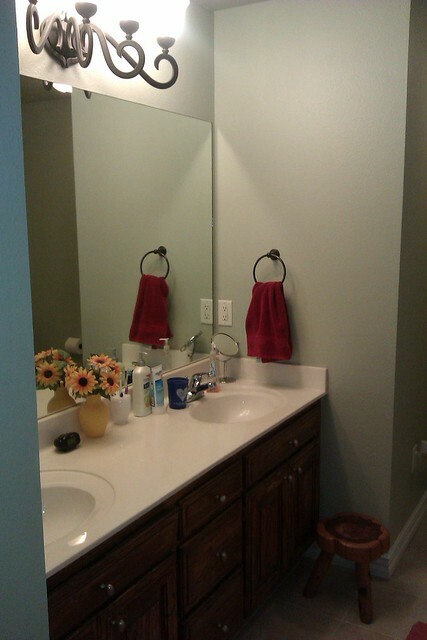 The boys bathroom is a lot bigger than our last house. This is the view from the hallway. The colors/decor is all from the last house. The shower curtain, believe it or not, is from Walmart. The little step stool was a gift given to Brayden by one of my best friends, Mary Virginia. very pottery barnish, don't you think? I love it! I LOVE LOVE LOVE this sign. 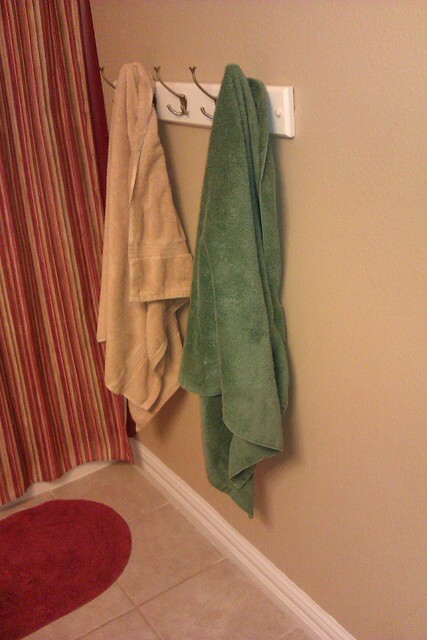 I'm thinking I may make a smaller version of it for the bathroom, to go over the hand towel hanging on the wall. 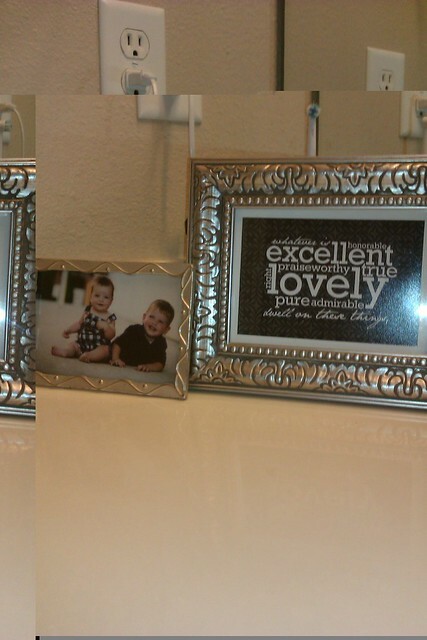 We're also going to frame out the mirror like this.